Established in 1958, Hindustan Pencils Pvt. Ltd. is the biggest pencil company in India. They export to over 50 countries worldwide. However, in the US, we don't see very many of their pencils, and if it weren't for the tireless efforts of CW Pencils, I would have never heard of them. The Nataraj and Apsara brands are made for India, and the Nataraj brand is sold worldwide. They have entered the European market as well under the name SiVO, where they sell some of the Apsara styles (like the Absolute) rebranded, as well as some SiVO branded colored pencils in the USA. It is also widely accepted (however unconfirmed, as far as I can tell) that they make the Walmart Casemate brand of pencils. I believe Walmart sources those pencils from multiple vendors, so a quick check to make sure it says "Made in India" and those should be the ones. For the price, those Casemate pencils are hard to beat. They make a few different styles: yellow #2, a "premium" that is a dead ringer for the Apsara Platinum RT, and some Neon pencils, for which The Weekly Pencil did a comparison. You and the box you came in. 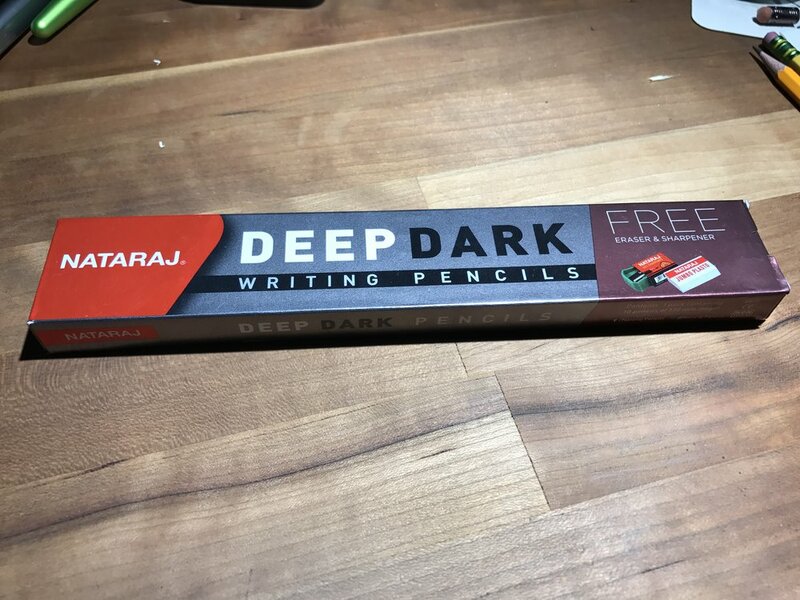 The pencil I'm reviewing today is the Nataraj Deep Dark. I purchased it from a third party seller from India on Amazon, as it isn't one of the pencils CW carries. I don't have much information on this pencil...it's not even on the Hindustan Pencils website. I have reached out to Hindustan about these...at post time, I have yet to receive a response. If they do return my inquiry, I will post an update to the review. Like inside most Hindustan Pencil boxes, there was an included eraser and sharpener. The eraser is very good. The sharpener works, but is too short of a point for my liking, and I won't be using it. When I first opened this box, I didn't know what to expect. I have used many Nataraj and Apsara pencils, but never these. I had never even seen or heard of these before I stumbled upon them on Amazon. Let's just say I was not blown away when I opened the box. The lacquer was not the usual quality that I had come to know from them. This pencil is two colors, striped, but the colors are so close that they clash and look ugly. It's like when you accidentally put on two different black pants and shirt on...they're both black, but they don't quite match. That's the two different grays in this pencil. One matches the imprint, and it's a little silver-ish, and the other color is a darker gray with a bit of purple in it. Like a dark lavender. And the striping is a tad crooked and not as clean as some of their other pencils. As I said above, the end is dipped in the silver, but something has happened to the paint, because on the very end, it looks as if cracked or the color wasn't quite mixed all the way. See the picture to see for yourself. It looks unfinished. The silver foil imprint is clean and true, and it's probably the best part of the pencil, looks-wise. 10 out of the box. This just looks crappy. They're all like that. It just looks like bad lighting instead of 2 different colors. Chipped and cracked. Was fine after sharpening. The wood is Jelutong, usually saved for the cheapest of pencils. Most of the Hindustan pencils are extremely inexpensive (not "cheap" in the crappy sense of the word), but they don't all use the wood. Some are basswood, some may be other woods, but none I've used have been cedar. They even use Jelutong on their flagship of the Nataraj brand, the 621. They do have many factories all over India, so maybe they just use what's on hand at any moment and go from there. So far in my testing the jelutong has been fine, although some of the unsharpened ends have flaked off on the edges, taking some lacquer with it. However, once sharpened, the wood is fine. Left is with the Carl CP 80, right is with the included Nataraj. Now down to the important part of the business...the core. A great core can take a crappy pencil to new heights. While this is not a great core, it is very good. The pencil is called "Deep Dark" and it lives up to its name. This is supposed to be a Writing Pencil, according to the box, and the point durability allows this pencil to claim that title. Writing with my "pen pressure" the pencil still lays down a darker than HB line, and with my normal pressure, which is quite heavy, the line is smooth and dark. I'd say this pencil fits between the Nataraj 621 (lighter and harder than this) and the Nataraj Bold (darker and softer) It's closer to the Bold in "tint", but right in the middle between them in hardness. There was not a lot of smudging on the 3 pages I wrote, but then again, I'm not a lefty. I try to drag my hand over it to see what it will do, but to no avail. There was some ghosting in my Field Notes Two Rivers (50# Finch Opaque White), but only when I wrote on the back of a page I had written on before did it do that. It erased fine with the Seed Radar eraser and the Pentel white eraser cap. The cores were all centered according to the two I sharpened and the eyeball test on the rest. At 4.4 grams, this sits on the lighter side of some of the other Nataraj / Apsara pencils. It comes in a full 2 grams lighter than the Apsara Absolute, and just marginally heavier than the Apsara Beauty. So of course it feels very balanced and light in the hand. With no eraser it is not top-heavy. The paint, while shiny, is not glossy and slick, and even my sweaty mitts can hold on to this pencil with ease. This is not Hindustan's finest pencil. But they make really good pencils, so something has to sit on their low end. That would be the Nataraj Deep Dark. I can get past the lacquer if everything else is decent, and in this case, it is. There are better offerings from Nataraj and Apsara, and I implore you to try them if you haven't. This box was $4.49 on Amazon (free shipping) for 10 pencils, an eraser, and a sharpener. So if you say the eraser and sharpener cost 50¢ a piece, you're looking at about 35¢ per pencil. Not bad, but when the eraser tipped Walmart Casemate are 97¢ for a box of 20 and are the same wood, better lacquer, similar cores, and possibly-more-than-likely made by Hindustan...it doesn't look so great. I won't recommend the Deep Dark as a must have, but they are a "not bad, get some if you want".